First step is making the brownies, I bought a Pillsbury Valentine Brownie Mix. Make sure you line a 9x13 pan with aluminum foil, then follow box directions and pour batter into the lined pan. After letting the brownies cool, place in freezer for 30 minutes. After 30 minutes- pull brownies out by the foil. Next, using a cookie cutter, press heart shape into brownie to create a heart shape. Keep the extra brownie pieces for layering. In a small bowl cut half of the strawberries and pour 1/4 cup of strawberry syrup over. Place in fridge for later. In another mixing bowl, mix together cream cheese, condensed milk, milk, pudding mixes and vanilla extract. Stir in one container of Cool Whip and 1/4 cup of strawberry syrup. 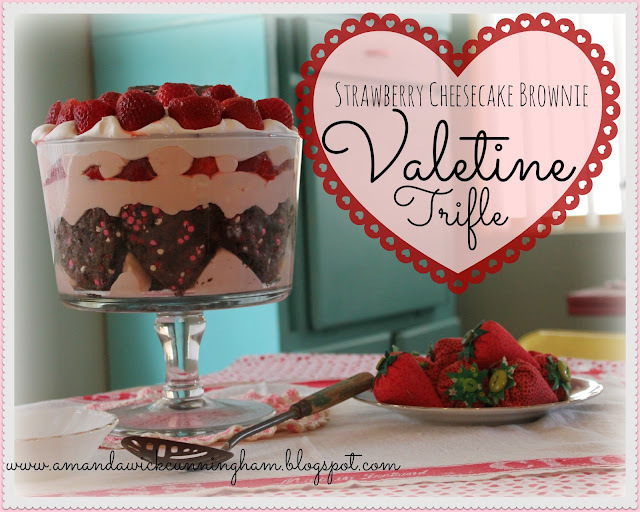 Place heart shaped brownies along the bottom of a medium trifle bowl and fill the center with brownie pieces. 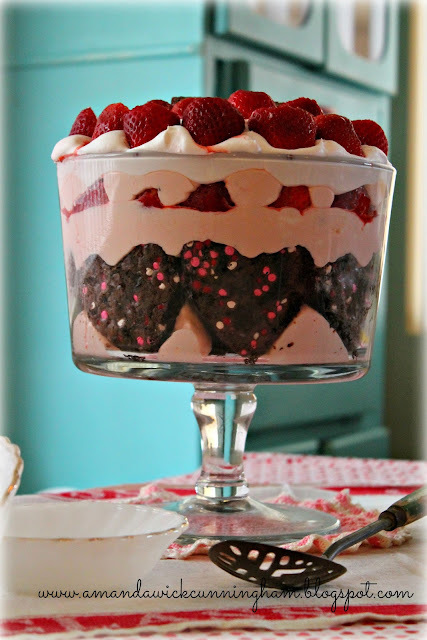 Gently pour Strawberry pudding until it reaches the top of the heart brownies. Then layer with strawberry/syrup mixture and brownies. 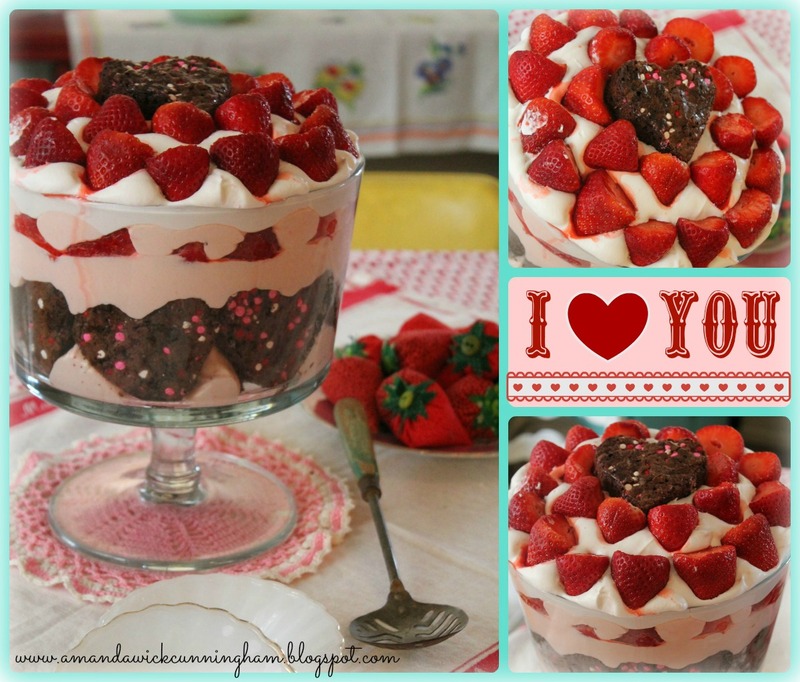 Layer again, with Strawberry pudding. Last, place fresh strawberries on top with a heart shaped brownie in the center. Delicious and beautiful heart shaped desert that was made with LOVE!!! Oh, wow! This looks delicious. I would love for you to come over to my blog hop and share this and other posts there! Thank you, it was delicious. Mr. KofColors even had seconds! Thank you so much. It was hard for Mr. KofColors to not eat it right away! This looks great! The heart brownies really make it. The brownies and the pudding make it so rich and delicious. Next time I may use dark chocolate brownies. Thanks so much for visiting. WOW! That is so pretty! Thanks for sharing it with us! This looks great. I am going to try this for Valentines Day! Found you from the Countrified Hicks blog hop. New g+ follower here.